While traveling the eastern United States, I often wonder what the area might have looked like before it was settled, logged off and conquered by a growing population moving west. I have imagined standing on top of the Blue Ridge Mountains, looking west, and seeing ridge after ridge of untouched wilderness. Today, there are interstates, power lines and towns around every turn. It is still beautiful in many ways, but the landscape has been knuckled under by our nation’s rampant growth over the last 300 years. In Utah, a similar tale is unfolding as the sprawling metropolis of Salt Lake City laps against the benches of the Wasatch and Oquirrh Mountains, a growing civilization thirsting for more land on which to expand. Who knows where it will end and what open spaces will be devoured by development. 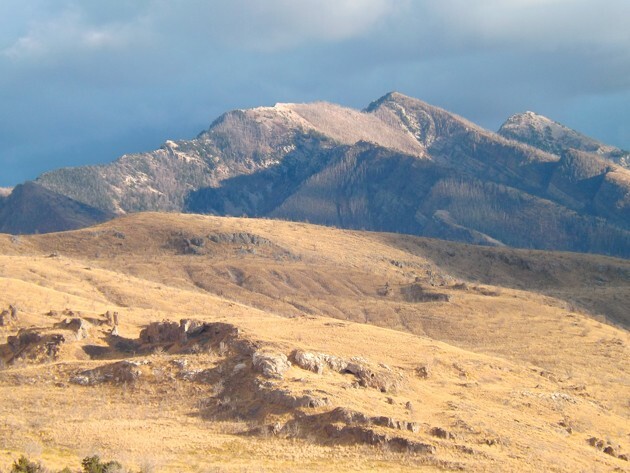 One thing is sure, however: We are lucky in Tooele County, because just west around the point of the Stansbury Mountains is a vast, empty landscape that is awe inspiring, soothing and lonely. That landscape is called Skull Valley. Its name may sound ominous, but it is a beautiful place to be almost any time of day. Recently, I wrote about the interesting desert anomaly called Horseshoe Springs. But just across the road to the east is another interesting area where primitive camping is allowed, two-track dirt roads approach the mountains and rugged, barren peaks assault the sky. 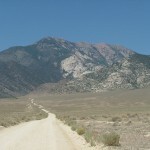 Low hills, consisting of knolls, rock knobs and limestone reefs, extend in a north to south trending configuration between the highway and the higher peaks of the Stansbury Mountains. A walk through this area can be enjoyable after you have explored Horseshoe Springs. Some people may dismiss the place due to its dry appearance, but if you take some time to walk across it, you may discover some surprises. To get to this area, follow Interstate 80 west to exit 77, which is the Dugway/Rowley exit. Turn left and head south under the freeway on SR-196, which is also known as Skull Valley Road. About 10 miles south of the freeway, you will notice a prominent knoll on the left next to the highway. Just before you reach the knoll, look for a good dirt road that heads east along the knoll’s northern base and past some Bureau of Land Management signboards. When I visit this area, I usually follow the maintained dirt road across the cattle guard and park just on the other side because the road deteriorates quickly beyond that point. A few weeks ago, I went there in the late afternoon as a storm was brewing to the west over the Cedar and Lakeside mountains. 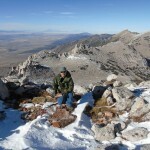 I put on my pack and headed southeast towards a prominent rocky point on a low ridge in front of the Stansbury Mountains. This area can be considered unpleasant by some. The soil is rocky and sandy, and there are cow pies everywhere, along with ant hills and cheat grass. Any junipers that were here burned in the catastrophic Big Pole fire in 2009. Bleached skeletons of the trees remain on the benches. But if you look closer, you’ll see sagebrush, sunflowers, salt bush and other more visually pleasing elements. 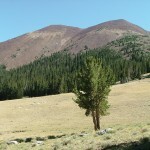 As I began to climb the knoll, Skull Valley below became more clear with each step. I climbed to the base of a limestone fin and noticed a 10-foot wide natural gunsight in the rock. It framed the southern Cedar Mountains beautifully. I looked at the valley’s big emptiness and then considered the black clouds rolling in from the north. I had a rain coat, so I kept going. When I reached the base of the limestone fin, I noticed that the top of it is caked several feet thick with ancient, white Lake Bonneville coral. Several pieces of the coral have broken off over time and litter the base of the rock. I found an interesting piece, and after checking it for spiders, put it in my backpack to add to my rock collection. 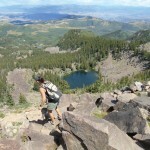 On top of the reef, I continued west and tied into a old, almost indiscernible two track trail. I followed it over a low ridge to where I could see the entrance to South Broons Canyon. The wind was howling, so I found a place on the leeward side of a rock and sat down to eat lunch. You have to be careful on these limestone rocks because they are rough with serrated edges and will cut your clothes. For years I have daydreamed about exploring South Broons Canyon because of a pocket pine forest there that escaped past fires. I have also heard that there is a perennial stream the flows a short distance and cascades over rocks in a small waterfall. Old maps call the place “Aspen Spring” and one of these days I will go and follow that canyon up to the top to see if the old tales are true. I had covered a couple miles from my parking spot when the first rain drops started and I thought it wise to get back before the road turned to muck. On the way down, I found a limestone piece that I was able to pick out as if it were part of a puzzle. I thought about how many countless millions of years that rock had sat there before I saw it and picked it up for my rock collection at home. As I reached my vehicle, lightning began to flash down from the approaching storm and I was thankful to be off the exposed hills. A silent walk in these foothills is a refreshing experience. There’s something about seeing God’s unsettled creation that is soothing for the soul. I highly recommend the experience.